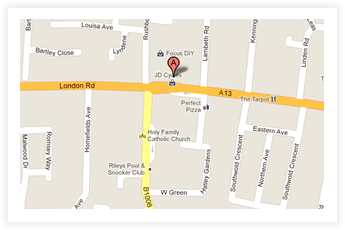 Situated in the small town of Benfleet, South Essex, KJ Green has a proud 50-year history as an independent Opticians. Our welcoming practice applies its significant optical expertise with a real emphasis on customer service, making us an ideal provider of Designer Glasses, Sunglasses and Contact Lenses. Drawing from our vast experience within the industry, we have taken the most successful aspects of both modern and traditional practice methods, and combined them to create a unique and distinguished service that both ourselves and our patients can be proud of. Our dedication to excellent patient care is complimented by our commitment to keeping up with the modern requirements of optical practice – making sure that we use the latest methods and technological equipment available in order to provide the very best service possible for our patients. Ask about EYEPLAN for its vast range of member benefits and lower priced spectacles. K J Green Opticians is responsible for having performed sight test examinations on hundreds of thousands of Castle Point patients throughout the last fifty years, and have developed a positive reputation as one of the top eye care specialists in the area. Many will recognise the name of Ken Green, whose voice will been heard answering questions about eye care on BBC Radio Essex's 'Sound Advice' broadcast for over twenty-five years. Within the UK, K J Green Opticians were one of the pioneers of Retinal Photography, with patients of our practice among the first in the country to be offered the service. Since then, over two thirds of our patients have opted to have their retinal images taken by, and stored at, K J Green. Our long-term dedication to innovation and standards within eye care is a value we we take great pride in, and this is still at the core of our principles to this day. We strive to offer the traditional values of service and clinical care whilst using the latest equipment in modern, air conditioned rooms. K J Green Opticians truly is a modern representation of everything that we have found to be successful about our practice over the last 50 years, and we aim to use what we have learned in order to provide the best possible service for our patients for the next 50 years to come.